Hey there everyone! 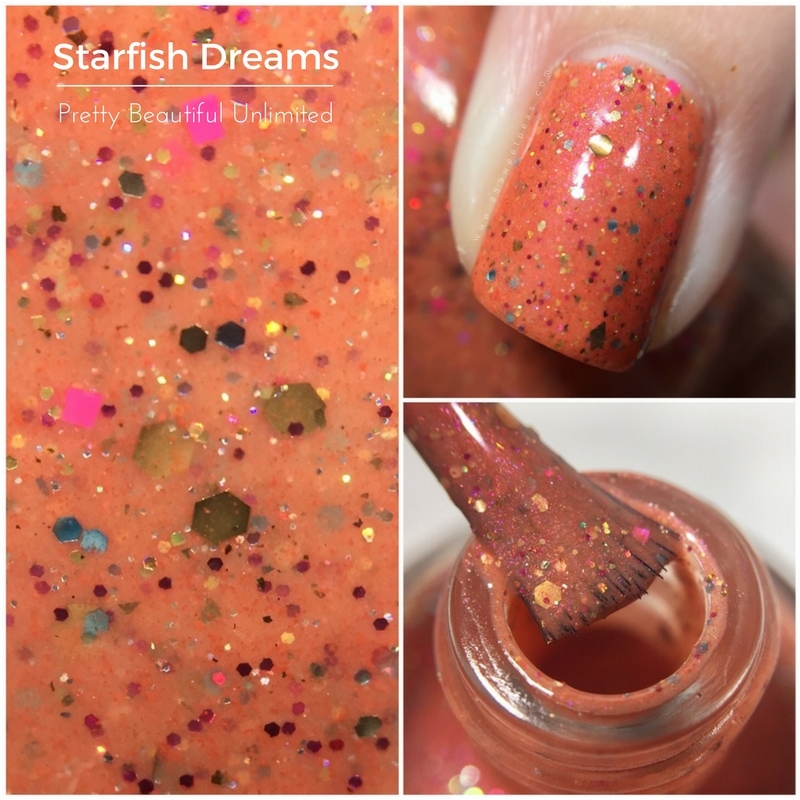 So today I am super excited to be sharing 6 new polishes with you from the brand new "Fantastic Fish and Where to Find Them" collection that Pretty Beautiful Unlimited will be releasing! They will be releasing Saturday, June 10th, at 11am CST. So who is ready for swatches! A bright blue cruelly base with red shimmer. Pink, gold, magenta and blue glitters in various sizes. I am in love with this blue! The polish color and glitter mixture is just so fun and happy. The formula was amazing as well. The crelly covered completely in 2 quick coats, and applied nicely. Medium yellow crelly base with a blue shimmer running throughout. 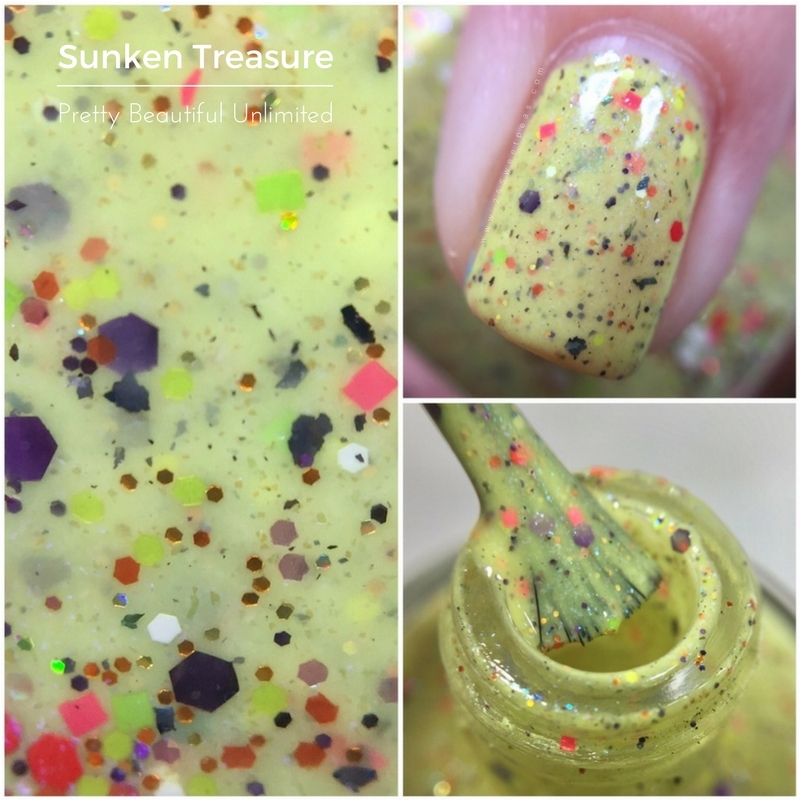 Packed with orange, yellow, white, gold, purple, and pink glitters along with flakies. 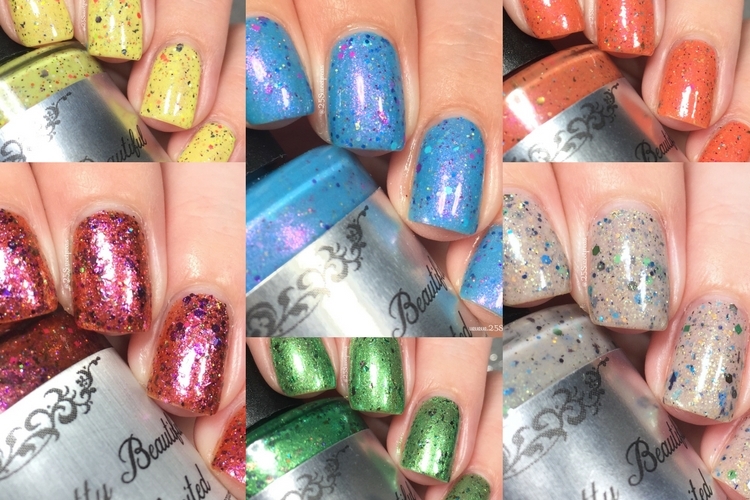 The Flakies shift to various colors such as; violet, red, orange, pink, purple, blue, gold. Another amazing application. Basically I am going to start sounding like a broken record because all of these are amazing. The ratio of glitters and flakies are spot on and there is no need for fishing to get them evenly distributed across the nail which is super nice. The name was spot on! Its like you are looking into a full treasure chest filled with all kind of goodies! A muted orange base with a slight red shimmer through out. With that is has glitters that appear in various color combos such as; gold, bronze, silver, blue, and pink. Perfect once again. The pop of pink in this one is so fun, and them you get a splash of blue which makes it so fun! 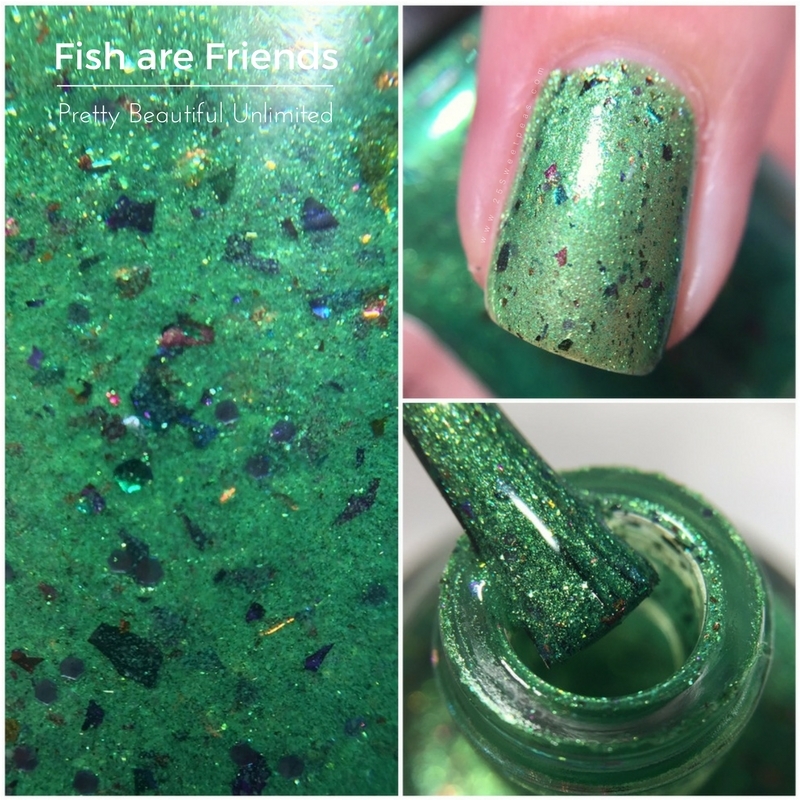 Bright green shimmer with a semi metallic base with flakes that shift; pink, purple, blue, green, copper, gold, and fuchsia. This shimmer/semi metallic polish is stunning. Makes me want to wear green polish more often. It applied flawlessly, and I mean just look at the color. Its like some shade of green you would see in a coral reef photos. Also once again, that name! I just hear Bruce going, "Fish are Friends Not Food". Which ya know I say a lot myself. I am not a fish fan. They only "sea food" I really like would be Shrimp, Calamari, and occasionally clam strips. :) Also as I am writing this I am realizing it sounds like I have watched Nemo many times lol! Haha, I think thats due to growing up with it, then baby sitting, and watching it in a Marine Biology Class! Hehe! A taupe gray crelly base with flakies that shift from teal to navy to violet. Then there is a slight green shimmer running throughout. Then on top of that you then have gold, brown, tan, blue, and green glitters in various sizes. Love. Yep I love this! This is so unique and fun. I totally get the name too. the colors of glitter really do remind you of sea glass. Its so hard to find, but last week I actually fond two pieces that were the green shade that appears in this polish. Fun fast, I am working on a book and have gone to Pinterest and made a board for it. So basically there I will go find things to help people visualize the place I have created in the book. 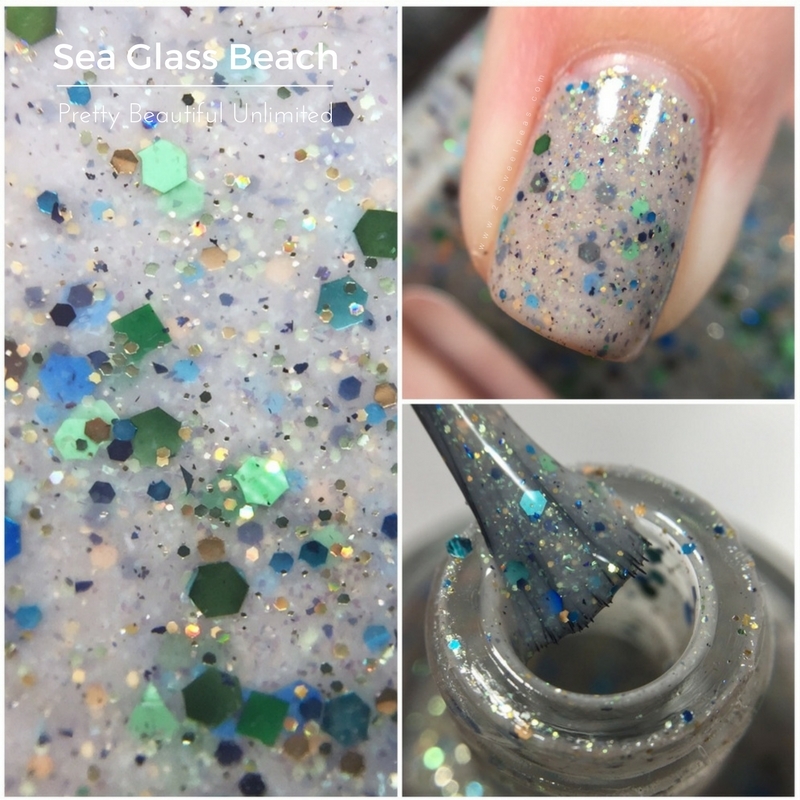 Anywhoooo it is beach based and there is a beach house and I have described counter tops for the kitchen that actually have sea glass in there and the picture on Pinterest totally reminds me of this polish. Look at this. So fun! A lightly tinted orange/copper base with violet/red chameleon pigment. The flakies shift from violet to pink to gold along with violet, copper, pink, purple, and green glitters. Words can't describe this polish. That second coat brings it to life and its just stunning! I actually even included to extra footage in the video of this in "flash" mode and its just soooo neat! You have to at least go find that part in the video! Well that is it for today! These will be releasing on June 10th at 11AM CST the link below will take you to the Pretty Beautiful Unlimited store! Also if you are over their shopping check out her Cuticle Oils. They are my favorite, and work amazing! Plus there are so many scent options that are really nice!